Advances in technology are creating the next economy and enabling us to make things/do things/connect with others in smarter, cheaper, faster, more effective ways. But the price of this progress has been a decoupling of the engine of prosperity from jobs that have been the means by which people have ascended to (and stayed in) the middle class. Andy Stern, the former president of the Service Employees International Union (SEIU) spent four years traveling the country and asking economists, futurists, labor leaders, CEOs, investment bankers, entrepreneurs, and political leaders to help picture the U.S. economy 25 to 30 years from now. He vividly reports on people who are analyzing and creating this new economy?such as investment banker Steve Berkenfeld; David Cote, the CEO of Honeywell International; Andy Grove of Intel; Carl Camden, the CEO of Kelly Services; and Geoffrey Canada of the Harlem Children's Zone. Through these stories, we come to a stark and deeper understanding of the toll technological progress will continue to take on jobs and income and its inevitable effect on tens of millions of people. But there is hope for our economy and future. 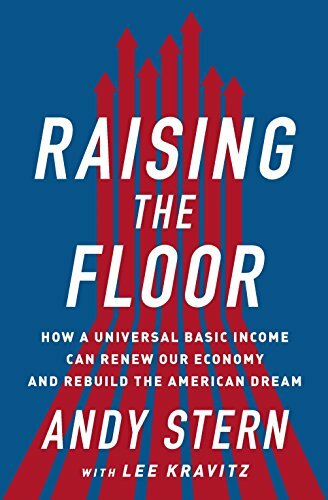 The foundation of economic prosperity for all Americans, Stern believes, is a universal basic income. The idea of a universal basic income for all Americans is controversial but American attitudes are shifting. Stern has been a game changer throughout his career, and his next goal is to create a movement that will force the political establishment to take action against something that many on both the right and the left believe is inevitable. Stern's plan is bold, idealistic, and challenging?and its time has come.